In a recent Lancaster County Court of Common Pleas case of Perrone v. Lancaster Regional Medical Center, No. CI-11-14933 (C.P. Lanc. Co. 2013 Cullen, J. 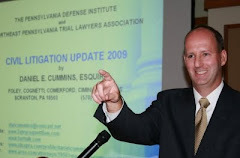 ), Judge James P. Cullen crafted a novel method of handling a Facebook Discovery dispute in a civil litigation personal injury case. This case involved an alleged slip and fall in the defendant hospital allegedly resulting in significant injuries to the Plaintiff. According to a May 20, 2013 Legal Intelligencer article entitled "Judge Orders Parties to Hire Neutral Expert to Probe Facebook," by Ben Present, at the center of this discovery dispute was photographs of the Plaintiff playing in the snow along with a video of the Plaintiff sledding down a hill and tumbling off the sled at the bottom of the hill all the while laughing. While the defense contended that these photos and the video post-dated the subject accident, the Plaintiff asserted that these items pre-dated the accident. Judge Cullen granted limited discovery. In his two-page order, Judge Cullen ordered the parties to hire a "neutral forensic computer expert" to analyze the Plaintiff's private Facebook page during the 17-day window in which the Defendants claim the photographs and video arose. In its Order, the court directed that the neutral expert was to identify all photographs of snow and references to snow on Plaintiff's Facebook page, along with any photos depicting the Plaintiff participating in physical activity during the specified time frame. The parties were required by the Order to agree upon an expert within seven days of the court's Order. The court also mandated that the discovery be completed within 60 days. Under the Order, the court directed that the expert was to retain the Plaintiff's Facebook username and password and then download the contents of the Plaintiff's Facebook to a hard drive on which data for the time period at issue was to be isolated. The cost of this process, including the expert's fees, was to be covered by the Defendants, Lancaster Regional Medical Center and Hospital Housekeeping Systems, as the proponent of the discovery request. As noted by Ben Present in his article in The Legal Intelligencer this "case appears to be the first matter in which a Pennsylvania judge has ordered the hiring of such an expert to review a party's Facebook information." I send thanks to Ben Present of The Legal Intelligencer/Pennsylvania Law Weekly for providing me with a copy of this decision. I have updated the Tort Talk Facebook Discovery Scorecard with this decision. You can always access the Facebook Discovery Scorecard by going to Tort Talk at www.TortTalk.com and scrolling down the right hand column and clicking on the date noted under "Facebook Discovery Scorecard." Once on that page, you can access the actual Opinions and Orders by clicking on the case names. Here's a quick LINK to the Tort Talk Facebook Discovery Scorecard.